Mathematics lab is a place where students can leave and explore maths concept and verify facts through a variety of activities using different materials. Our maths lab is a well equipped lab which includes furniture, all essential equipment raw materials and other necessary things to carry out the activities effectively. It provides an opportunity to students to understand and internalize the basic mathematics concepts through concrete objects and situation. It enables the students to verify or discover the geometrical properties and facts by paper cutting and folding techniques. It enables the teacher to demonstrate explain and reinforce abstract mathematical ideas by using concrete objects, models, charts, graphs, pictures, posters etc.. Observation and experimentation are the sources of physical knowledge. The NCF states “The child should be engaged in joyfully exploring the world around and harmonizing with it. To nurture and develop the skill of investigation and experimentation in children, the physics lab in our school is equipped with all the basic and necessary instruments and models. Teachers encourage children to perform activities and learn by doing rather than by rote. The chemistry lab in our P.S.C. School has been developed in such a way to fulfill the need if the students to face the Practical effectively. The lab is well equipped with several apparatus and all the possible reagents and chemicals. The lab is so designed for the young minds to pursue a sense of joy, a spirit of inquiry and sense of adventure and crave for more learning and ask meaningful questions to gain more. Biology laboratory is well equipped with overhead projector, slide projector, film projector. They are used to enable the pupils to love the subject. All the specimens are exhibited in the glass cupboard. All the charts are hung on the wall to help the pupils learn easily. 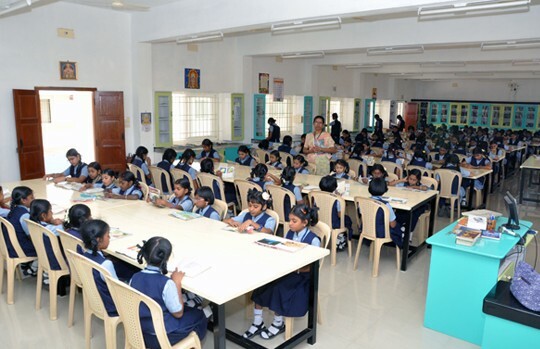 Individual chairs and conference tables are provided to the pupils. The Human Skeleton System kept in the lab attracts everyone. Two computer labs with corporate standards and two multimedia rooms with LCD and audio system were constructed in the block. Our School Activity block is a paradise for the students to explore the world of computers. The Language lab is a well equipped, sound proof, state of the art lab that facilitates the use of modern audio and video techniques for English learning.The lab can accommodate 44 students. Each student is provided with a head phone through which she listens to audio clippings. The words are recorded with correct phonetic sound in each and every student’s mind and are reflected back in their expressions. There are 21 systems with LCD monitors for the use of the students. The lab helps in enhancing the quality of communication and prepares them to face the very competitive world outside. No of reference Books class-wise. 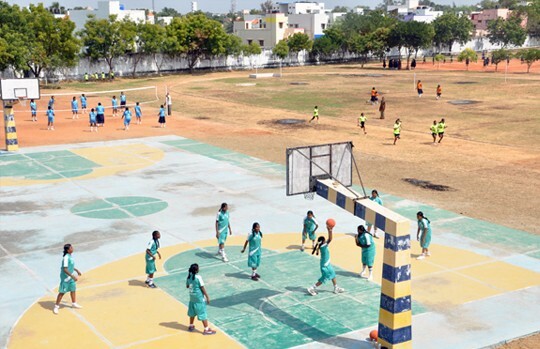 Our school playground has courts for volley – Ball, Basket Ball, Tennikoit, KhoKho and Badminton to enable the players to train themselves steadily and win the tournaments.There is a mini park for Tiny-Tots with See-Saw, Swing and Merry -go-Round. We have a good indoor stadium for the students to play chess, Carrom, Table Tennis. The main contribution of technology to education is audio visual aids. Our school enables the faculty to adopt modern educational technology as a means of learning experience. 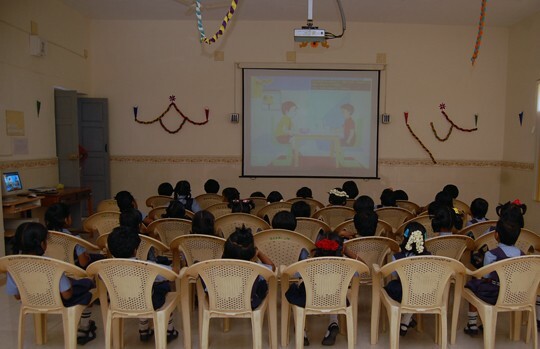 All sorts of audio visual aids are available in our school and our staff uses them effectively in their classes. It is of much use to conduct the Morning Assembly, Special Lectures and other school meetings. It is fully furnished so that 1200 students can be seated at the same time. Our school has a magnificent Auditorium with equipped with a very good audio system. TA magnificent refectory provides a delicious and nutritious lunch for all the students, tiffin to the tenth standard students and refreshments to the players in the morning. 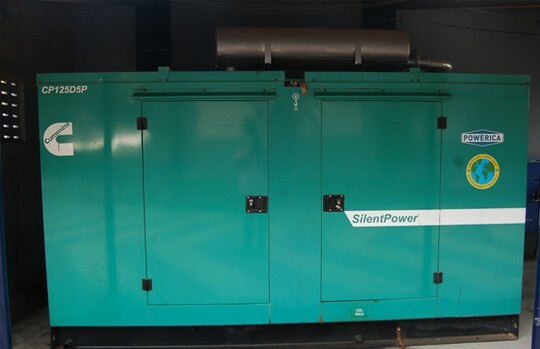 A generator is set up at the entrance to supply electricity to the whole school during power failure. A mini Zoo with love birds, duck and a fish tank is maintained to drain the stress in the students. A lush green lawn and the main entrance arch win the adoration of the visitors. 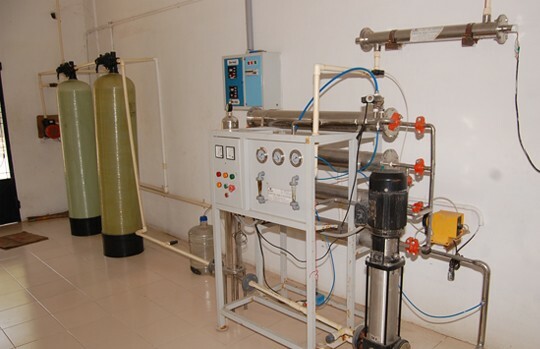 A mineral water plant is installed to supply pure drinking water to students. Three water coolers are also provided for them. Our hostel has the capacity to accommodate 26 students from std. VI, to allow them to continue their education at our school while their parents are transferred. To make their stay hale and hearty they are provided with healthy and nutritious food and safe drinking water. Washing machine and water heater also are fixed to make their work easy.